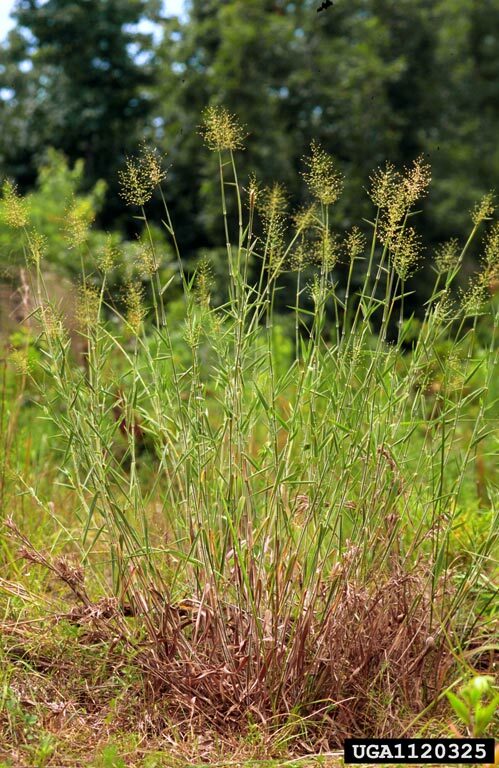 Dichanthelium scoparium.James H. Miller @ USDA-NRCS PLANTS Database.James H. Miller and Karl V. Miller. 2005. Forest plants of the southeast and their wildlife uses. University of Georgia Press., Athens (Accessed 5/2014). Dichanthelium scoparium is a perennial C3 grass (Washburn et al. 2015) 70 cm to 1.5 m tall, stems solitary or few from a knotty root crown, plants velvety, long-hairy with a sticky but hairless band just below the densely hairy nodes, sheaths loose but often tight near top, densely hairy except for a hairless, sticky strip along the back, ligule 0.1 cm. Leaves lance-shaped, 10-25 cm long, 1-2 cm wide, some smaller, tip pointed, base rounded, slightly narrowed, hairy on both sides. Flower spikelets numerous, 1-flowered, 0.2-0.3 cm, hairy; inflorescence oval, 8-15 cm, hairy; spring phase June-Aug.; autumn phase densely branched from middle and upper nodes, branches with clusters of smaller branches, leaves reduced, inflorescences small, few-flowered; blooming and fruiting July-Nov. Frequency in NYC: Very infrequent (NYS rare, S1, E). Habitat: Wet soil, p H 4.5-7.5; tolerant of shade, intolerant of drought, salt, fire, anaerobic soil (USDA, NRCS 2010).